This was a book that, when I was reading it, gave me a lot of feelings, both good and bad. This novel is actually two stories. In one, we have the story of Darcy Patel. Darcy has written a novel and it is being published. Just graduated from high school, Darcy leaps into adulthood by moving to New York City, getting an apartment, and making several new friends within the publishing community. In between the chapters of Darcy’s new and exciting life, we have the chapters of her actual novel, Afterworlds. In this story, Lizzie is at an airport during a terrorist attack. This near-death experience brings her in contact with the world after ours. She meets some dead people, and some almost-dead people, and finds herself caught up in a whirlwind of danger and intrigue. Okay, so, some thoughts. First off, while I frequently do enjoy books with dual storylines, this one just didn’t work for me. I think the primary reason is that one of these stories was supposed to be fiction within a world that is already fiction. I don’t really know how else to say it, but it made it hard for me to really get into both of these storylines since they weren’t both set in the same world. It was too much like reading two entirely separate books, which, in a sense, I was. However, I did enjoy the discussions that Darcy was having with her publishing friends about her struggles with rewriting the story, and a sort of commentary on different aspects of the story, usually right before or after I had read that chapter of Lizzie’s story. For instance, in one of Darcy’s chapters, someone mentions how they love the word “bungalow.” Darcy makes a mental note to look it up since she doesn’t know exactly what a bungalow is. In the next chapter we read of Lizzie’s story, someone is living in a bungalow. Little things like that made the parallel story fun. A lot of the language is really quite lovely. The real world worked differently than stories. In a novel you always knew the moment when something Happened, when someone Changed. But real life was full of gradual, piecemeal, continuous transformation. It was full of accidents and undefinables, and things that just happened on their own. Westerfield tackles some deeper topics through his story with Darcy, especially about the question of whether or not authors can write about things/religions/experiences that aren’t theirs firsthand. Darcy is from a Hindi family, and one of the main characters in her novel is a god in Hindi writings. As the story progresses, this is a concept with which Darcy wrestles, because she is not a practicing Hindu, and she’s changed the character and idea of the god she’s used in her story into someone quite different from the traditional writings. There is a great scene where she is talking with a friend of hers, who is a practicing Hindu, and asking him whether or not he finds her use of this god to be offensive. Pardon the long quote, but I just really enjoyed that entire passage, and it made me realize why sometimes having religion in books bothers me and sometimes it doesn’t. Simple, but brilliant. And really, the question about whether or not an author can write about experience he has not experienced first-hand is an engaging one. The first reaction, that I hear frequently is “No, of course not!” but the truth is, all authors do (unless they’re writing an autobiography). Someone who writes a murder mystery is not (usually) a murderer or a detective. How is that different from having a man write a story about a woman? Authors will always write about experiences that are not their own, which is why I don’t mind reading a book about a young lesbian Indian girl written by a middle-aged white man. Plus, it was just a little too insta-love for me. Like not completely, but kind of. It really felt like it came out of no where, just all of a sudden, “Oh wow you aren’t just my friend, I’m actually a lesbian and I love you and we should live together and our life is amazing.” It wasn’t really the love-part that bothered me, I think, it was, once again, the complete devaluation of friendship. Because obviously it wasn’t possible for two people to be really good friends, and to just hang out and learn and write together – they had to be in a relationship, because, apparently, anyone who is close friends with someone, no matter age or gender, is at least a little bit in love with that person. I find that super annoying. Friendship is so important, and every modern writer insists on making every relationship sexual. So. Aggravating. Plus, I have zero interest in hearing about people discovering their sexuality, homo or heterosexual. Seriously, can it get more boring? “I have feelings! Wait, do I have feelings?! I think I have feelings! No, no feelings. Wait, yes, FEELINGS! SO MANY FEELINGS!” Gah. While Darcy’s story was all about feelings, Lizzie’s story was a lot about revenge and power, and a lot of it was kind of dark. Someone of it, actually, was very dark. At one point, someone gets murdered, and it’s a little gruesome for my tastes. 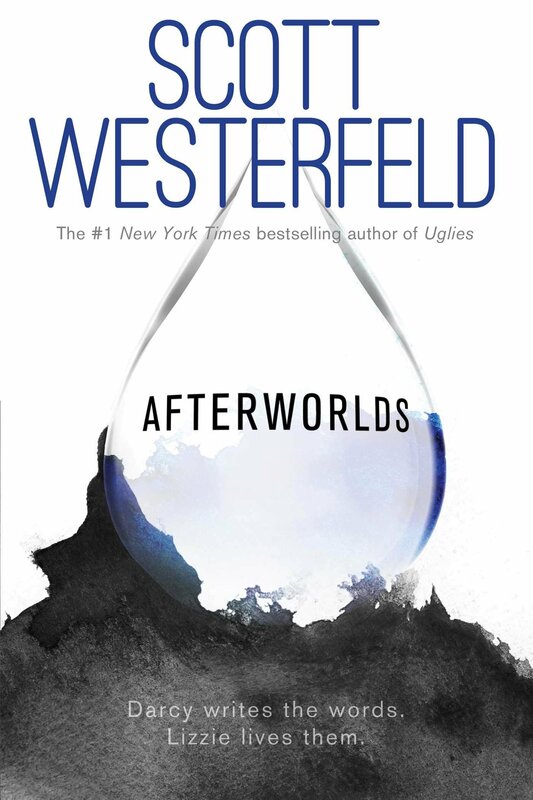 Overall, I found Afterworlds to be an engaging read, but it definitely wasn’t a book I want to return to time and again. I didn’t feel like Darcy’s and Lizzie’s stories flowed together as much as they could have (and, seriously? Darcy and Lizzie? And the only acknowledgement we get is like one throw-away line where someone is like “OMG you didn’t notice you named your main character Lizzie and your name is Darcy? !” and Darcy’s like, “No, but oh well her name is totally Lizzie now.” ??? Why did Westerfeld do this?? Is there something subtle I have missed??) and there was just a bit too much angst in both stories for me to really enjoy them thoroughly. Still, the writing was strong, and I appreciated Westerfeld’s willingness to talk about some engaging and challenging topics. A high 3/5 for me – a very good one-time read, but not a classic I yearn to place on my shelves. Maybe that was the point of truth – you could erase it all you wanted, and it was there to be discovered again. This entry was posted in Book Review, Fiction, YA and tagged Afterworlds, Scott Westerfeld. Bookmark the permalink. Yes, I couldn’t resist putting in that section, even though it’s a bit long for a quote. But I just loved the concept – it’s so true – and when applied to things that are important to people, like religion, it helps explain why some writing can be more offensive/irritating than others.